This isn’t a particularly difficult connection to make. It’s quite literal, actually. 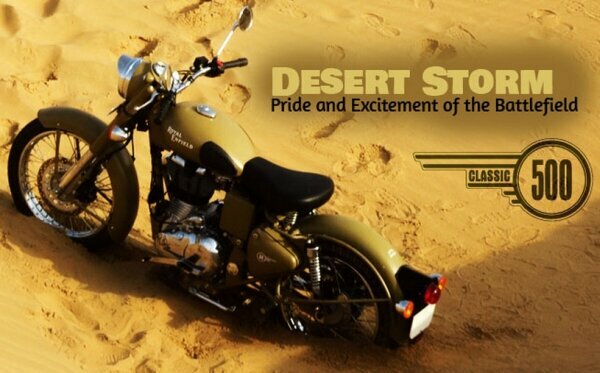 You don’t need to scratch your head about it, especially when I tell you that this latest avatar of the 500cc Classic is called the ‘Desert Storm’. Get it? Clear as mud, it is. You’re probably rubbing your chin and tapping your fingers on the arm of your chair wondering, ‘What could this possibly be about? What’s new here?’ Well, it isn’t as simple as the pictures look, really. This isn’t just a paint job. This is more.Royal Enfield, now steered by new leadership, has been talking to the people (and listening to them), taking notes and working toward expanding its appeal. Modern Enfields are no longer meant to turn their rider into the classic toolkit-wielding grease monkey. This is a modern motorcycle running on modern technology and competing with bikes from the new millennium. At least that’s what the company hopes to make it. Riding on the back of the old world charm of its Raj-era bikes has helped Royal Enfield along, as it continues to, but there have been a few bits we’ve quibbled about and Enfield says it’s ironed out some of the kinks. This ride in the middle of Rajasthan through some of the best roads in the country, running past vast dune fields, was to see if that development has really moved in the intended direction. In case you’re reading this with your fingers crossed, hoping the Classic makes more power after the update, bad news – it doesn’t. You still have to make do with the 27bhp that is on tap. However, the ECU has been remapped for better bottom-end performance and swifter response to throttle input. As I piled on the acceleration through the desert, I discovered Royal Enfield has walked the talk. The problem was, there really wasn’t anything I needed to slow down for on the highway, so I didn’t get a chance to taste the reportedly tweaked bottom-end response to tell the difference. But then, I turned off into some narrow village roads. Livestock strolling across the road or just parked in the middle gave me enough reason to slow down or stop and try the improved low-side response. Not the ideal scenario, with dung flying in your face, but yes, the ECU remap does seem to have helped. How it affects fuel economy we’ll have to wait and see, since the Classic has pretty limited range anyway. The riding stance on the Classic is now more relaxed because of the handlebar design, which has been altered for a more upright posture, with mirrors that allow enough clearance for mittens to pass through without complaint. Somewhere along the line, they’ve even tried to dampen the amount of vibration that filters through. Cruising along at just under triple-digit speeds feels comfortable and the bike manages this without any much fuss. However, if you’re part of the 60kph club, there’s bad news for you. If you’ve noticed, every bike is at its loudest and most vibration-happy at a certain engine rev range – on the Classic, that spot arrives at exactly 60kph in fifth. So either you change clubs and ride a bit quicker, because this Enfield can move, or you inaugurate the 40kph club. There’s also been talk of a stiffer chassis and suspension for the sake of better handling and high-speed stability along with the shift to a 19-inch front tyre, as opposed to the 18-incher that the Classic has had so far. The combination does make a difference and the handlebar wobbles less, but the problem is, instead of ridding the Classic of the problem, it now appears at a higher speed. So instead of going “whoa!” at around 100kph, now you can push on till very close to the limit and go “whoa” at around 120kph. Not the best solution, I believe. In fact, I’m not even sure it can be called a solution at all. Thankfully, the road between Jodhpur and Jaisalmer is straight as an arrow, except for a couple of mild corners in between. Unexpected rains had left the desert sands splashed with generous green cover and flourishing fauna to match. The combination acted like a natural speed limiter. Cruising along at 90kph, there’s little you can fault this Enfield with. The engine turns over smoothly and there’s enough grunt if you need to get past a slow moving target. However, the general consensus is that it can easily do with a taller fifth gear for smoother, more efficient cruising. Also, the single saddle is still not doing much for posterior comfort. The slightly changed angle and stitching haven’t made much difference, and after more than an hour on this seat, it gets torturous. The Desert Storm isn’t a simple paint scheme introduction, that much is clear. There are some real changes, which make the Classic more likeable and a bit more fun to ride. It still isn’t quite the sorted out machine that Enfield is striving towards, there’s still some way to go before that’s achieved, but it’s definitely an improvement and headed in the right direction. 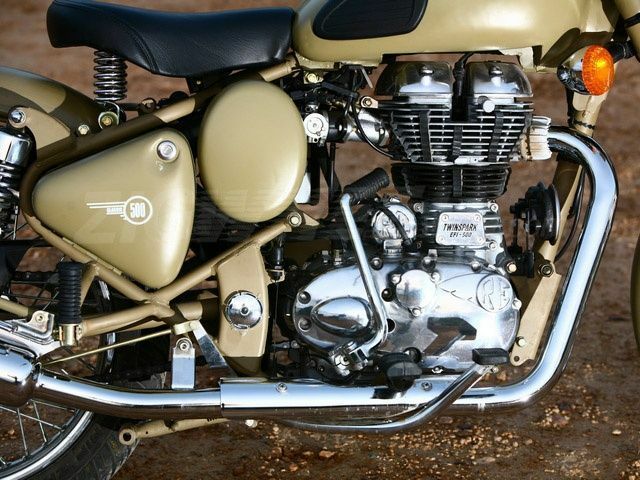 The special colours for the 500, Chrome and Desert Storm, look fantastic but will cost around Rs 5,000 more than a regular Classic. The string of modifications will however make it to all the new bikes, improving the package by that much. A better deal for the Enfield lover, but not yet the obvious choice of motorcycle for the touring types.This review has taken from BBC topgear.